Mercedes-Benz may add more variants to its future A- and B-class model lines, a top executive said. "We've got some more ideas, for example a three-door version of the A class, a convertible or a shooting brake," Mercedes-Benz sales and marketing head Joachim Schmidt told Automotive News Europe. No decision has been made yet, according to Schmidt. 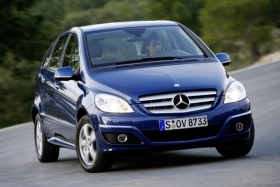 Mercedes will launch a new generation of the B class compact later this year (current generation shown). Thus far, the Daimler AG premium unit has said that the next-generation A- and B-class compact hatchbacks will be joined by an SUV and coupe-styled four-door model. All four derivatives will be underpinned by a new architecture that Mercedes has developed for its fast-growing compact lineup. Mercedes needs to add small cars to meet tighter EU emissions standards and keep pace with BMW and Audi in sales. The second-generation B class will be first of the new compacts to launch. It will arrive at European dealerships in late 2011. Daimler's new architecture also might be used by Nissan Motor Co. luxury brand Infiniti for its planned entry-premium rival to the Audi A3 and BMW 1 series. It is one possible result of the nearly 1-year-old alliance between Daimler, Nissan and Renault SA. Said Schmidt: "Yes, discussions (with Renault-Nissan) about basing an entry-level Infiniti on our compact car platform are still proceeding. But we have not made a decision yet." The partners will decide this summer whether Infiniti will use the architecture, Daimler sources said. Infiniti showed the Etherea entry-premium concept at the Geneva auto show last week. Infiniti Europe boss Jim Wright told Automotive News Europe that the concept hints at the packaging of the automaker's upcoming model. Infiniti's says the entry-premium car will arrive sometime after the 2013 launch of its first full-electric sedan.